Growing out bangs is doubtlessly one of the most traumatic hair experiences known to man or woman. Confession: I’ve been sporting blunt bangs for the better part of three decades. Hair is supposed to be about experimentation, and heaven knows I’ve tried, so hard! I’ve enlisted the help of top stylists, side-swept bang favoring friends, train cases full of bobby pins… I never make it past the uncomfortable in-between stage. 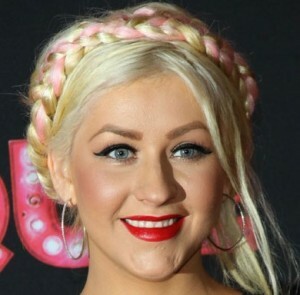 However, last week I uncovered a semi-recent picture of Christina Aguilera that fueled my fringe-shedding lust anew. Emboldened by this image, I did a bit more research into the process of growing out bangs and experienced hope for the first time that maybe I too could experience a bangs-free existence. Here are four ways to rid yourself of bangs that minimize awkwardness and even enhance the midpoint. 1.) Pretend they’re not there. While the pic of Xtina below features layering at the edge of the bang, the style is largely dependent on the hair being treated as if there are no bangs. This runs counter to what my bangless and sidebangs friends have told me about styling the lengthier fringe over one eye, which is hard to wear for some people. Styling bangs straight down the middle and off the face is a good option once they’re at nose-level. 2.) Pretend they’re not there, part two. When bangs are too short to style loose, backcombing hair and blending them in is an easy fix. This look is ideal with an updo, but can be used when hair is down, as seen below on Reese Witherspoon. Bumble and Bumble’s Styling Creme will make hair behave, but isn’t too heavy for the bang area. 3.) Twist and pin. This look, as seen on Sandra Bullock, is a bit limiting for every day because of its distinctiveness, but it has a very intentional feel to it, as if you meant to have cheekbone length fringe. Pick your part, and comb hair back toward your ears on each side. Pin just before the edge, and arrange longer front pieces to cover hair ends. Pin again to keep the longer strands in place, if desired. If you are into hair accessories, this is a great way to show off some fancy, vintage-style barrettes. 4.) Dramatic side part. Similar to twisting and pinning, parting hair dramatically and pinning them to the side is a bit less impactful and easier to wear a few days in a row. Take a teensy, tiny bit of a wax like Kiehl’s Creative Cream Wax and put half of it back. Seriously, minuscule. Warm it in your fingertips and gently coax the styled part to the side. Work the remainder into the ends of your hair before you’re tempted to mess with it any more. Kristen Bell’s one-pin style above epitomizes this look. Have you survived growing out bangs? Do you have any tips to ease the growing-out stage? Hands up if you’ve got a weakness for big jars of incredibly serious looking moisturizer. 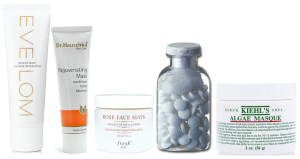 A good, non-comedogenic option is a nice mainstay, but the thick, creamy stuff in sturdy containers can never be surpassed in luxury by a moisturizing milk or lotion in a pump. Nighttime cleansing is always a bit more fun, because moisturizers for night are often much more luxe, creamy, soothing- everything you want in a treat-yourself face cream. Kiehl’s also has a knack for products that feel like the best quality staples. Unpretentious but not earthy, uncluttered but not humdrum packaging- their vast line is a favorite of beauty junkie women and product-aficionado men due to their timeless feel and strong core products. So I was quite excited to see a new addition, in an apothecary style, retro green jar hyped on my Facebook page. 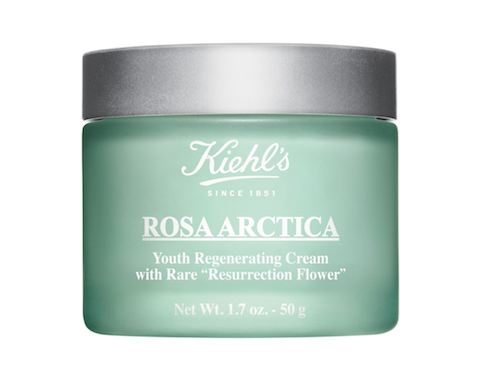 Kiehl’s Rosa Arctica Youth Regenerating Cream appeals on many levels. A fancy new ingredient- Rosa Arctica, more on that below- takes center stage with some very bold claims. Squalane is a great water binding ingredient that doesn’t encourage breakouts, trapping moisture in skin without encouraging sebum production. (Read: breakouts.) And Vitamin E is one of the few popular skincare ingredients with a truly proven track record of skin repair. Rosa Arctica (Haberlea rhodopensis) Known as a regeneration flower, it is able to survive up to 31 months in a dry-out cycle, by falling into anabiosis. When proper moisture conditions are restored, it returns to life within hours. On skin, it works to jolt cellular vitality, stimulating skin’s own collagen and elastin production. Launching this month, Kiehl’s Rosa Arctica Youth Regenerating Cream is currently in limited distribution- it’s available at the Kiehl’s website, and counters have testers, if not product. Neiman Marcus is also carrying the cream online, but it won’t ship if you order from the site until around March 22nd. Initial user reviews report Kiehl’s Rosa Arctica Cream has a thick texture (requiring you warm it up in your fingers before smoothing it on) that hydrates skin thoroughly but doesn’t alienate non-dry skin types. Product scent is described as faintly cucumber and floral note-y, with a faint medicinal smell. Have you tried Kiehl’s Rosa Arctica Youth Regenerating Cream at a Kiehl’s store or at home? What were your first impressions of the product? Thank you all for participating in my Blogmania giveaway, there were over 350 entries in total. Wow! Sabrina S.!! Thank you Sabrina for participating in my giveaway, please look for my email so that you can send me your mailing address. Congrats!!!! Thank you for stopping by my blog! I am so excited to be a part of the Blogmania event and I am proud to announce that YOU can be the lucky winner of over $150 in beauty products! 1. Subscribe via Feedburner (if you are not already subscribed) or simple enter your email address in the “Subscribe” box in the beige column on our site. Your subscription status will verified through the subscribers database. 2. 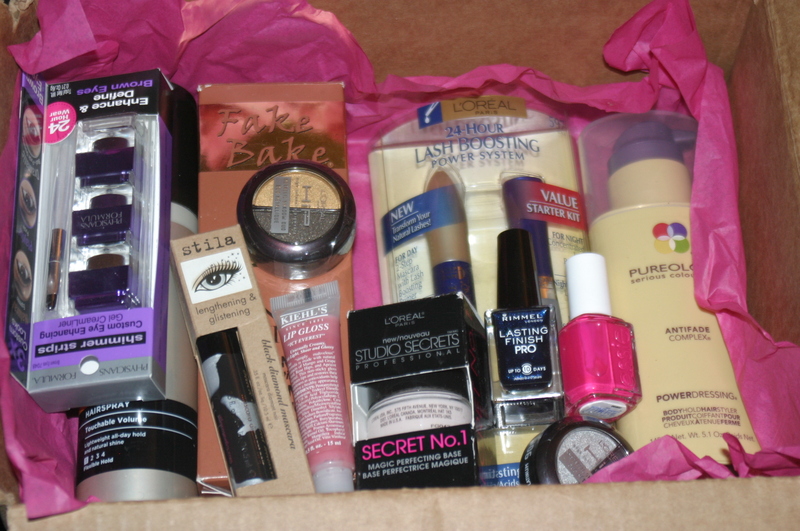 Leave a comment letting us know that you are a subscriber and why you would like to win this prize. This giveaway is open to residents of the US and Canada only, 18+. The winner will be chosen at random on September 17th , 2010. All entries must be received by September 16th 11:59pm EST.